Tru here. I was part of the original group when Dementia Mentors was formed 01 Jun 2014 (altho we started making videos in February LOL). I had tried mixed groups (with lots of care-partners and a few persons with dementia) but still felt off on my own, and could not connect well. Finding a peer group of others living with dementia was a breakthrough in how i dealt with my own symptoms. Dementia Mentors is not only an online texting peer group, but, thru virtual Zoom video Link, we visit in each other’s homes up to four or five times a week — without leaving the safety of our own home. During virtual chat, others can understand my symptoms, and i can understand theirs. We are all “normal” — while we are within the group. … and none of us is alone. This is not a formal “support group”, and you will often find us VERY casual (like in a bathrobe, LOL) ! As in any group, some are drawn to one person, while other folks are drawn to another person. I was especially drawn to several, one of the primaries being Susan Suchan. Susan had been living with primary progressive aphasia (a form of Fronto-Temporal Dementia) for almost ten years. As her symptoms progressed, increasingly the listener needed extra patience while she found her words and got her voice to cooperate. 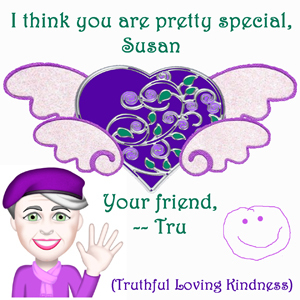 But it was always well worth the wait because her input was so very valuable … and Susan was just extra-fun ! In my own encounters with her during the past four years, Susan had BALANCE. The fun moments were extra-fun, and the helpful insight was no-nonsense; lets-not-play-games. What is the REAL situation … and what can be done about it ? It was a real joy knowing her, and i am so very glad that i was able to interest her in Dementia Action Alliance, an advocacy organization that arranged for us to speak in Atlanta, and arranged funding for that trip. So i was able to actually hold Susan, and hug her in real skin. ((top pic was my square of a blanket project for Susan & lower pic was taken when we spoke in Atlanta for USA’s Dementia Action Alliance)). 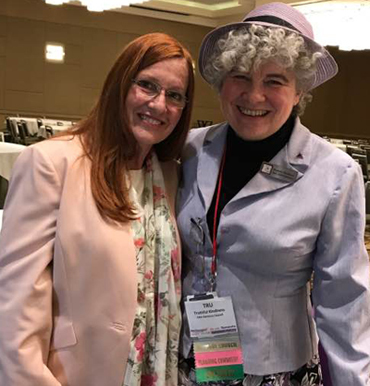 This entry was posted in Contributions from Others, Journal, Relationships and tagged dementia, Dementia Mentors, FTD, PPA, primary progressive aphasia, Susan Suchan. Bookmark the permalink.